We’ve been looking at how people would transport themselves and goods around the city. Our city is split into 5 sections currently. The centre which contains merchant & trading, politics, religion, farming etc on a tier system. Then surrounding this will be 4 floating areas. These four floating areas will hold the housing for the city of Rome and the housing will be encased within a modified version of Leonardo Da Vinci’s tank plan. The areas will be split up between the North, South, East and West of Rome. We decided to separate the communities like that instead of by their wealth. However within each area we will most likely dabble with this hierarchy of power, possibly with the richest in the North being at the top of the tank like a penthouse and then the poorer living at the bottom in sort of more hobbit like homes. However this post is meant to be about transport. So our two main forms of transport are Airships/Air Balloons and Leonardo Da Vinci’s self propelled cart which would travel around the city like the carts in Gringotts in Harry Potter. We took a lot of influence from bioshock with the floating city idea and one way they get about the city is by travelling along these skylines with magnetised hooks. We thought we could develop something like this within our world except make it more culturally accurate. Since Rome and Italy is a place of art and invention especially during Renaissance time I think it would be nice to implement ideas like this into our city. At the moment I am looking at various designs of ships from Pirate ships to ancient Roman long ships. I am also taking a look at a lot of fantasy airships as well as some final years in our course who have a floating balloon ship (Aohdan, Michael Mcrea, Bobby Strain, Sam Hudson and Rebekah Quinn). So far I have the rough layout of the ship done. I had a go at modelling some ropes that would tie the balloon to the ship and I think it turned out well. I asked Alec to help me out with some issues with the rope deforming in a strange way with the curves but he showed me how to fix it and its all good now. Now I’m just building up the details of the ship and seeing how I can include Roman architecture into the design of the ship. Here is where I’m at so far. Updated. The model has been finished and textured. There has been additions like windows on the side, extra details like banisters and fencing around the sides as well as reinforced areas on the bottom of the ship. A Roman style hut placed at the back of the ship like in old designs of Roman war ships. Added as well is a series of large crossbow on either side for defence. So I think this presentation went well this week, we got across what we did for the project and showed that we learned from our mistakes form the last one. Last time we were heavily but fairly criticised for our lack of teamwork and our lack or preparedness. This really motivated us this week to work together as a team and to show what we can really do, and I think we succeeded in showing that we are a strong team and that we worked really hard on this project. I am really proud of my team for this assignment and would happily work with them again on another future project. The presentation went really well this week. We kept under 6 minutes which was great and the rehearsal helped a lot for nerves. We all knew are roles but we learned the rest of the slides as well just in case. In the presentation I think we showed that we learned a lot from Vogler and the previous weeks. I believe are confidence and teamwork really shows how we learned from our own mistakes, one thing we had planned to put in the presentation was Implicit and Explicit meaning however we were unsure whether to put it in or not, in the end we decided against however we know for next time to put in anything that we have learned into the presentation and the project. So I won’t go into too much detail on this post since I’ve already talked about the schematic in the previous one. However I am just going to post my overall opinion on the final schematic. I think it turned out great looking, it may simple and straight forward but everything doesn’t have to be overly complex. One of the functions of a schematic is to be able to understand it as well as show the journey. There’s no point in having a schematic that you can’t follow. One thing that would have been cool to do would to have designed to go in a circle since the terminator series is looped constantly however in order to do this we would have had to continue the timeline until 2029 when Kyle and the Terminator come back to 1984 and the timeline starts again and unfortunately we just didn’t have the time to pull this off. Here is an image of our schematic however since its a jpeg it won’t be readable but I will attach a psd document on blackboard. Unfortunately the only way to have the whole schematic on a page and have the ability to zoom in a read everything is by using a psd file however this cant be opened on many programs including autodesks sketchbook which is free. So CGMeetUp posts a lot of animation reels and I saw this one that I really like. I’m a big fan of in game animations and cut scenes from games. I also like the blocky style that is shown here and I want to replicate that in some of my own models. I realise that this can cause issues with mesh colliding, it takes away from the realism and it’s a low polygon count that isn’t smoothed however I like that style. I guess I find hard edges in models and animations very appealing. So for our second assignment we were kept in the same groups as the Vogler assignment and given a movie to study. We were assigned The Terminator. What we had to do for this assignment was create a schematic of the movie and an artifact. We got lucky with our movie since it’s actually a really good movie and there aren’t a lot of main characters so the schematic isn’t that confusing. So what are main objective was (before starting the schematic) was to watch the movie a few times and write out notes, so we all went off and started writing notes. A few days later we came back with a so many. I did 11 pages of notes and I’m glad I did because it saved a lot of time having detailed notes instead of having to run back and try and find a certain clip in the movie. After all the diligent note taking we started on the schematic. We started by doing it out on the whiteboard however we soon realised that there was no way we could fit the schematic on the whiteboard so we moved on to the window using sticky pads to write shortened notes of the timeline. This took a long time, it was probably the most difficult part of constructing the timeline because it was the first rendition of it and lining all the timelines up correctly was very difficult. Once we finished this we kept on adding and improving it, switching the timlines around to see where they fit best depending on who they acted alongside with most and when they did interact or came into contact who made the contact? If Terminator chased Sarah down then his timeline would cross over a reach hers, if Kyle hunted her down then his timeline would cross over into hers. One issue we kept running into was the police officers timeline. Because the police play a big part in it we gave them their own timeline however during the movie a cop (Ed) becomes a vital part of the story so we didn’t know whether to give him his own timeline from the start or have him come out of the police timeline when he is introduced. In the end we decided that we would give him his own timeline whenever he enters the story and that his timeline and the police’s storyline intertwine so much that their timeline would be the same. I think this was a good decision because he was doing the same as what the other cops were doing in during the movie which was look for Kyle, Sarah and the Terminator, but at certain points when he interacts with Sarah and the rest of the main characters we had him specifically come out of the police timeline then enter back in to the police timeline when he was finished interacting. Once the initial lay out was complete we drafted it again to make it more clear. We sat down together and stared writing out the timeline on paper so that the lines would be clearer. It ended up being 8 pages long but it felt longer after working on it for so long. After this was complete it was time to start the final schematic. This took a while. First we had to figure out what to do it on, we weren’t sure about Prezi but it was an option but so was google docs. In the end after much deliberation we went with google docs because we could all work on it at the same time and see each others progress as we went. One issue that we found from the second draft of the schematic was that the timelines were unnecessarily confusing, they could have been simplified more so Rhea moved the timelines around a little bit and cleared that issue up. We moved them simply to make the timelines easy to follow and interact with each other. We colour coded each of the character timelines so that it is all clear and it’s easy to follow each of the lines. We also colour coded the text boxes with the colour of the dominant person in the scene so for example if Kyle was explaining to Sarah about the Terminator then the colour of the text box would be Kyle’s colour. Overall I think the schematic ended up looking really nice and I’m very happy with the restructured layout of the final outcome because before in the drafted versions it was very messy and everyone’s timelines cut across each others and even though that still happens in the final timeline its a lot more structured. Surprisingly this wasn’t as difficult as I thought it was going to be, probably down to my team mates having awesome ideas but still I thought coming up with ideas was going to be a lot harder. Méabh, Dervla and Rhea where together (unfortunately I couldn’t be in uni at the time) and were really interested in doing something with Terminator’s arm, they started drawing up concepts and looking at how they could make it look as realistic as possible, we stuck to the initial plan for the artifact mainly however one of our ideas was to at skin folds around the wound in the arm with liquid latex. In the end this was too expensive so we didn’t use it instead we ripped the mudrock to create the wound and it left a really nice effect that made the skin look frayed, broken and burned. I think one of the best parts about the artifact is the Meccano fingers that Méabh designed. When she showed us what she was doing I started looking into the anatomy of the human hand, specifically the tendons in the hand and the forearm. The creation of the arm was a lot of fun and a little bit terrifying. The creation of the artifact was a really great way to work together as a team, it allowed all of us to work on it together which was a lot of fun and really made the time go quick, it turned something daunting into a fun task. To prepare for the creation of the artifact we did sketches, concepts, made lists the usual. Everyone in the group was very excited about the arm and couldn’t wait to get started. Here are some of my hand sketches, anatomical studies and concepts. As we developed the artifact further it just kept getting better and we kept getting more involved. We couldn’t stop working on it, we added a base with gravel and burned newspaper, we used hot glue and paint for blood, we worked on it right up until the night before never thinking it was perfect and wanting to add more to it which. It has been a project that we poured all of time, effort and even a little bit of blood into (Thank Méabh for that for cutting me in the process of taking the arm off). I would love to work on a project like this again with this team. Here are some images of the artifact from start to finish. So here are some final images of the arm (taken and edited by Rhea). So we’re starting to do harder animations. At least for us. So before we start rigging or modelling a character we began with animating a pre rigged character. This character is Jonas the lamp. Our task was to get him to jump. Now at first this was pretty hard, it seemed pretty complicated. But after watching the video Conánn gave us once or twice it began to click. It’s all stages, you start by positioning it where it starts, where it lands and where it is mid jump. It’s all a step by step process, you’re just building up layers of the animation. 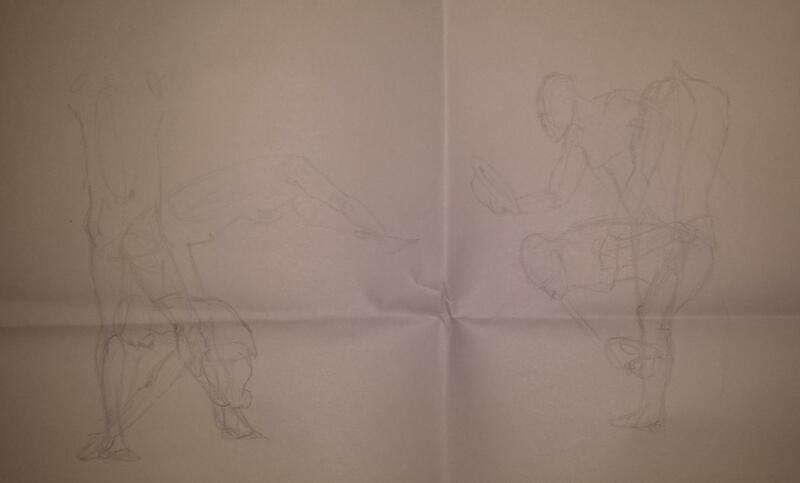 First you get he positions correct, then you squash and stretch, then you can mess about with timing and continue by adding more layers like rotation. After all the basics are done you can start to give it more character, like pushing it forward ever so slightly to show that its anticipating the jump or stretch the shoulder area so that it looks like its putting a lot of effort and force into moving forward. It’s the little things that make it come to life. I enjoyed working with Jonas, it was nice to start working on a character animation. I’m liking the freedom that we have to just play about with him and making him do different things since it’s already rigged. I’ve made him jump but I want to try more by maybe making him look scared by making him shake or look around nervously. With the light as well it could be a nice effect seeing that dart around in the dark. Even with such a basic character there’s a lot that you can do, which I think is something that Conánn, Michael and Alec are trying get us to really see. That really complex models aren’t always the best thing to have especially when animating. That complexity isn’t always necessary to convey what you’re thinking, and I think this is going to be really important in our short animation.